I recently wrote a News & Views article for the journal Nature Neuroscience. It was my first primary-author paper as a grad student and I'm super excited about it. However, it's hard to share this with all my friends and family because 1) the article is behind a paywall, and 2) it was written for neuroscientists, not a general audience. So, I've decided to present a simplified, free version here! If you want to check out the actual article, as well as the original research that is summarized, they're both available on the Nature Neuroscience website. To put the topic of the article in the most extremely generalized way possible: What can we tell about something from how it looks? We can examine the teeth of a great white shark and assume that it's a vicious predator. Or we can see a giraffe's long neck and suspect that it needs to reach high places to survive. Structure often gives us many clues about function. And this is true in neuroscience too. 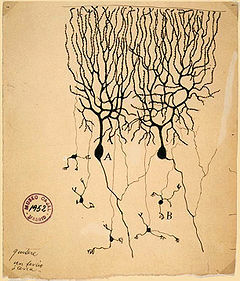 A neuron with a broad, elaborate arbor of processes (see right) is more likely to receive and integrate diverse information than a neuron with only a few simple processes. together in the same area. This is troublesome because the technique we usually use for assessing neuronal activity during functionally-important times (like during a specific behavior) involves sticking an electrode semi-blindly into a living brain and listening to the chatter of all the neurons in a certain area. It's extremely difficult to make connections between neuronal activity in a living animal and detailed structural data obtained from dead brain slices. This was the challenge taken on by Pablo Henny and his colleagues at Oxford, who approached the problem with a combination of technical prowess and brute force. The brain area they chose to investigate was the substantia nigra pars compacta, or SNc. 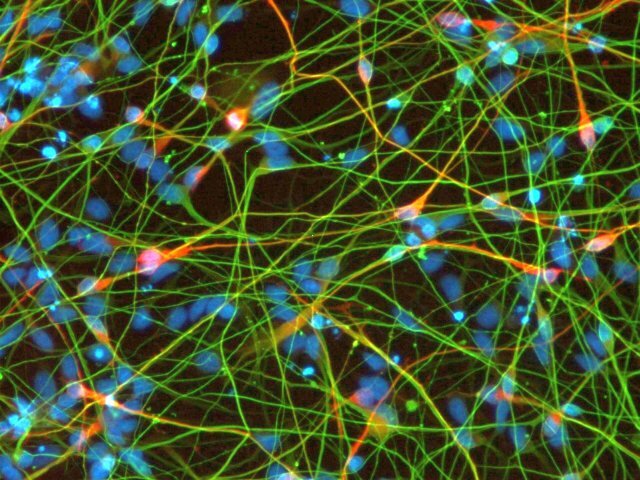 This is the home of neurons that produce dopamine, a chemical responsible for feelings of reward and motivation. Most drugs of abuse hijack the dopamine system, and the hallmark of Parkinson's disease is a loss of dopaminergic neurons in the SNc. For researching form and function in the brain, the SNc is a great place to start. 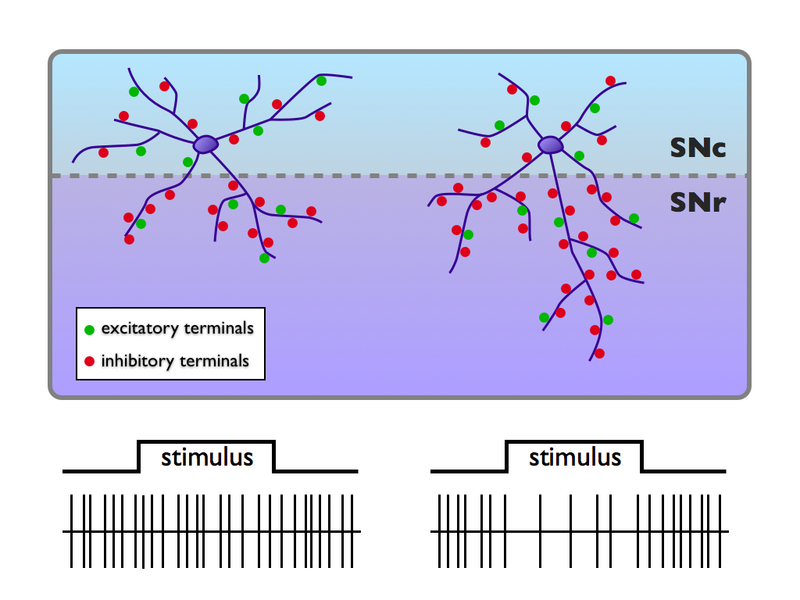 Neurons in the SNc are also a great example of a tricky heterogeneous population. Researchers had previously found that individual SNc neurons exhibit varying responses to different kinds of stimuli. So for example, when a rat's tail is pinched, some cells increase their activity, while others get quieter. But no one really understood how or why these different patterns of activity occurred. Henny and colleagues devised the following solution. First, they stuck electrodes into the brains of living rats and recorded the activity of SNc neurons during an aversive stimulus (a tail pinch). 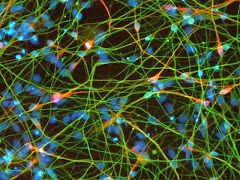 Then they used a technique called juxtacellular labeling, which fills the neuron next to the electrode with a dye that can be imaged later. Now they had single neurons whose functional activity was known, and they could do detailed analyses (once the brain was sliced up) of the structural and anatomical properties of each individual neuron. The results of their study are summarized in the figure below. Looking at the anatomical structure, Henny and colleagues found that SNc neurons vary in how much of their processes extend into an adjacent region called the SNr. They also labelled excitatory and inhibitory inputs onto each cell and found that processes in the SNr received more inhibition. When they compared this to the response to the tail pinch, they discovered that cells with more processes in the SNr are more likely to exhibit a decrease in activity. Which is exactly what you'd expect, since these cells are receiving more inhibitory inputs. The current study is an impressive demonstration of a thorough analysis of form and function. The technical prowess of this work is that they do a beautiful job filling and imaging neurons. And the brute force aspect is that they had to do this for LOTS of cells in order to actually draw conclusions rather than simply reporting isolated observations. These results give us new insight into the brain's dopamine system -- a system of particular interest because of its role in so many behaviors and diseases. But beyond this, similar techniques can be used to investigate many other brain areas with heterogeneous neuronal populations. We can make new connections between what a neuron looks like, in terms of its static anatomical structure in a dead brain slice, and what it does functionally in a living animal. The doors are wide open for unraveling new information from the architecture of the brain.